The Oca headquarters seems to have shut down for the season! As they won the July Palio they are not participating in the August Palio and it seems that the celebration days have officially ended! I mentioned in an earlier post that only 10 of the 17 contrade run in the race so the seven that didn’t run in the last Palio all run in the next one and then the balance are chosen by straws (I believe) but the last winner apparently does not run. It is all very complicated. The Via where their headquarters is had actually been closed to traffic until this past Monday. I assume it has been closed off since July 2nd (the day of the Palio), so three weeks. So now that the road blocks are gone I was able to take a decent photo of this once raucous Via. If you follow the center of the pavement down to the yellow house and then up the side of the building my window is on the right side of the yellow house under the window that has some laundry hanging out to dry (the laundry may look more like a dark blob in the photo!). 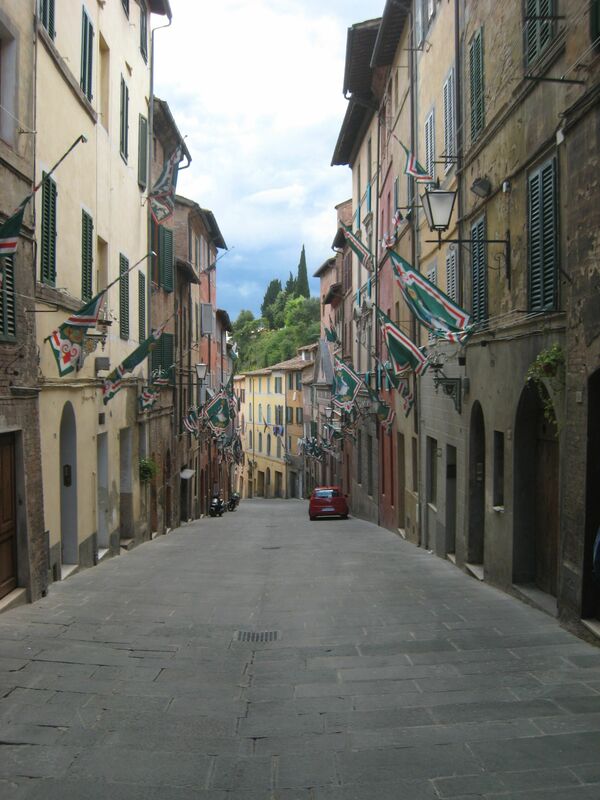 This entry was posted in Contrada, Italian language school, Siena and tagged contrada, contrade, Oca, Palio. Bookmark the permalink.